You want to add a set of web parts to your publishing page layout, so that when users create new instances of a page using your layout, the page is created with some web parts already added to the page for them. You may want the web parts in that web part zone to be editable or not, or to not allow users to edit that web part zone. Add an event receiver to the Pages library and add web parts to the page using code. I’ve never tried option1, this seems a bit overkill to me, but certainly a viable option in the right circumstances. I’ve tried option 2, without much success – I’ve been able to add stock web parts this way but not custom developed ones. The remainder of this post will discuss option 3, adding the web parts to the page layout using the AllUsersWebPart element. In here we can see a couple of web part zones, TopZone and BottomZone, with TopZone being configured as read-only. 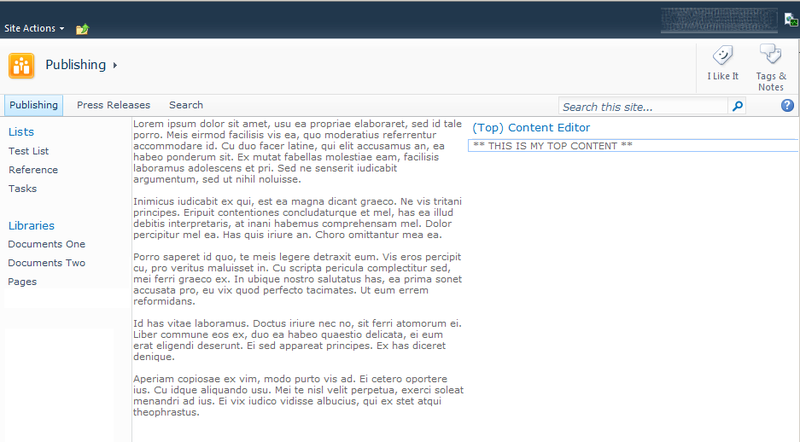 We will add a default web part to this zone so that is displays on every page created using this page layout. 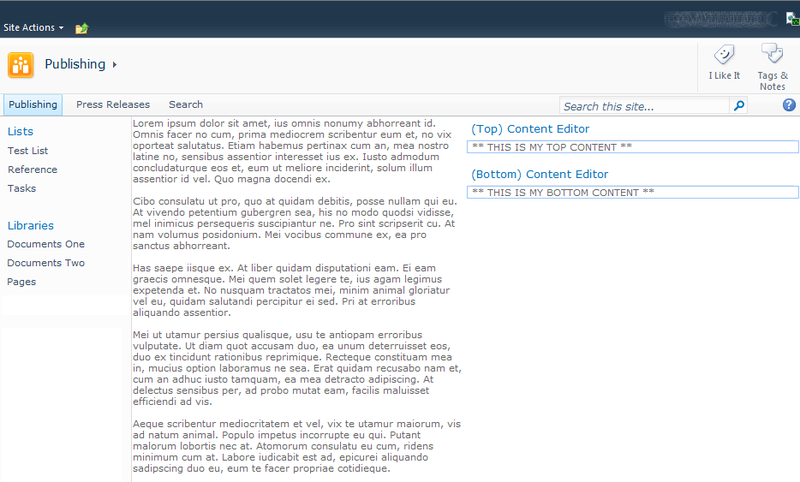 And in this case the web part zone with the default web parts in is configured as read-only, the second (Bottom) web part zone is available for user to place there own content in. So this is great from a content authors point of view, but what about page instances provisioned via a feature? Pretty standard stuff, we’re creating a page instance using our page layout (which includes default web parts) into the Pages library. However when this page gets created after you activate the feature, the new page instance doesn’t get the default web parts (in the page layout) added to the page. In the example above I’ve added the same default web part to the TopZone web part zone (just as in the page layout) and I’ve also added another web part to the second web part zone (BottomZone), and when this page instance is created, it shows both web parts. Hi Thanks for the explanation. but I have a question…? Is that sandbox solution or farm solution…? thanks for this article, i tried your solution on my project, it worked, but webparts are duplicated automatically after i create my page, i have 20 duplicated webparts now. Phil, thanks for the article, it’s the most comprehensive one I’ve found on automated provisioning so far. I haven’t had a chance to experiment yet but could you tell me: can you configure custom tool parts from here? So far I have saw many examples setting Title, Description and so on but we have custom opens setting file paths, additional ids and the like and I’m looking to get these configured at deployment time as well. Will return with the answer if I find it before your reply. Yep it’s easy. All you have to do is add your custom property like any other. Can someone confirm that this method still works? I have literally copied and pasted your code and it is providing no errors, but is not populating the web parts into the zones. I have applied same steps on our side, i m getting below error while choosing given page layout.